Tamper proof design provides a higher level of security to prevent battery removal. Eliminates annoying low battery chirps. No batteries to replace for the life of the alarm. 10 year sealed batteries provide continuous protection, even in the event of a power outage. Smart Alarm Technology virtually eliminates nuisance alarms. Quick activation battery pull tab makes this fast and easy to install. Deactivation key switches alarm off and makes batteries safe for disposal (once alarm reaches the 10 year product end of service life). Tamper resistant feature prevents deactivated alarm from being reinstalled. Choose this alarm if you are looking for an alarm with superior nuisance alarm resistance. 10 year product end-of-service life warning sounds when it is time to replace alarm. This alarm is suitable for installation in houses, apartments, dormitory and manufactured housing. For maximum protection, install an alarm inside every bedroom, outside every sleeping area and on every level of the dwelling. 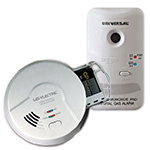 Meet New Laws & Legislation--This alarm exceeds industry standards, and is listed to UL Standard UL 217 and is California State Fire Marshal approved. ECO Friendly - reduces environmental waste & eliminates disposal of up to twenty 9 volt batteries. 10 Year Limited Warranty on both battery and alarm. Permanent Power also saves money from battery replacements (up to $38.00 over the 10-year life of the alarm), eliminates annoying low battery chirps and helps the environment by reducing environmental waste from disposed batteries. 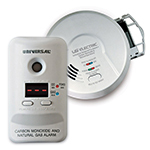 This smoke and fire alarm features microprocessor intelligence to assist in completely eliminating nuisance alarms, a single silence/test button to quiet a non-hazardous alarm and an end-of-service life warning that sounds when it's time to replace the battery (approximately 10-years from activation). Perfect for replacing existing Universal Security Instruments Alarms, this 2-in-1 smart alarm includes a large mounting base to cover imperfections in drywall and the option to replace retrofitting applications. The quick activation battery pull tab makes it easy to install while the deactivation key switches the alarm off. This makes the batteries safe for disposal. Once the smoke and fire alarm is deactivated, the tamper resistant feature turns on to prevent deactivated alarms from being reinstalled. This USI Smart Alarm conforms to UL 217 Standards. 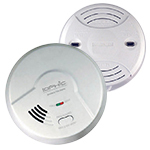 This 2-in-1 smoke and fire alarm has also been approved by the California State Fire Marshal and Federal Housing Authority (FHA) to exceed industry standards. For maximum protection, install an alarm inside every bedroom, outside every sleeping area and on all levels. The Universal Security Instruments MI3050S 2-in-1 Smoke and Fire Smart Alarm comes with a 10-year limited warranty that covers both the battery and alarm. I placed the alarms in 7 places after I did the first one the rest were easy. They were easy to twist on and off the base 10 years of no battery replacement is a nice feeling. These smoke alarms were easy to install and look good. It's good to know that we won't have change the batteries every year and hear the beeps when they need it. Delivery was very fast. No complaints with either products purchased or service provided. I purchased 55 new smoke alarms to replace my 10 yr. old smoke alarms. I had hard wired smoke alarms but decided to go with the 10 yr. Battery alarms. They were very easy to replace and quickly done. I liked the fact that the plate was a little larger to cover any blemish on the ceiling. Now we feel very secure for the next 10 yrs. This product is exactly what I wanted. I replaced all the old smoke detectors I had with it. My only issue is that the mounting bracket could use an installation template so the holes for a slide on installation would be more obvious. Oversize base-plate is excellent. No problem covering all signs of old installation. Easy to temporarily remove when time to paint the ceiling.